Major upgrades continue within Washington Park. 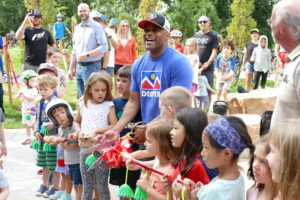 Denver mayor Michael Hancock cut the ribbon during the new playground opening on the morning of August 18th. Councilman Jolon Clark (seen in background), Councilman Paul Kashmann (right) were also present. The city is planning on building a new replacement playground near the bathhouse. We have few details on this project at this point. The best way to keep in the loop and influence the future of our park is to join our e-mail list. Welcome to the Friends and Neighbors of Washington Park website.